Chaney, who have lived in their home in the Harvest Woods subdivision for about one year now. Jennifer and Jon hope to raise their three daughters, Keller, Campbell, and Carsyn. The Chaneys have mixed metals throughout the home, including gold, chrome and stainless steel. Most of the home’s interior is pated white, except for the kids’ rooms, and an occasional light gray. With three daughters between ages two and seven, life is indeed busy for the Chaneys. Jennifer is a full-time stay at home mom who has great structure and organizational skills that keep the house in great order. Jon is an employee benefit consultant for CBIZ, where he designs, implements and manages employee benefit programs for employers of all ages. He has been commuting to his home office in Brentwood, but is thrilled about the upcoming launch, June 1, of CBIZ’s first office in Murfreesboro. Both Jon and Jennifer, who’ve been married for almost 12 years, are long-time residents of Murfreesboro, both having graduated from MTSU. The Chaneys are thrilled about Jon’s office opening up their Murfreesboro branch, since it will free up about 10 hours of Jon’s time a week in which he spends driving. Depending on the day of the week, the family’s evenings are filled with the homework, gymnastics, church, extra-curricular activities, playing with their neighborhood friends and a women’s and men’s Bible study group that both Jon and Jennifer have participated in for more than 10 years. 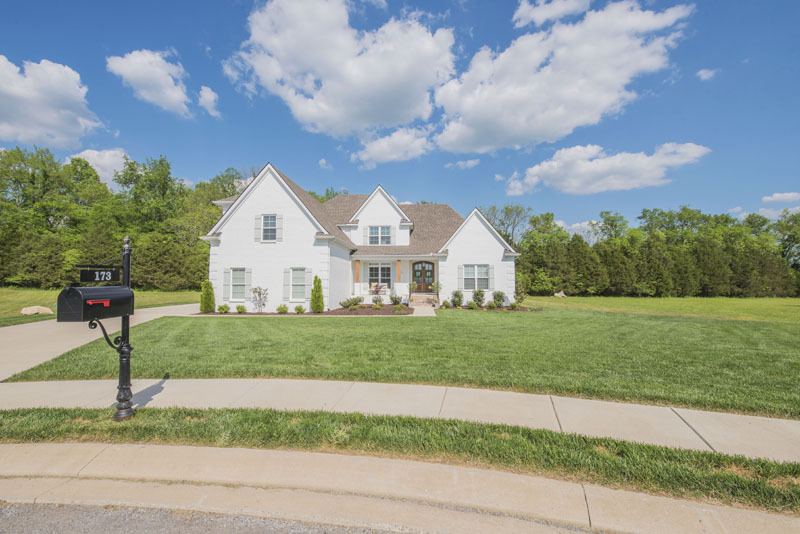 The Chaneys chose their neighborhood for a variety of reasons, starting with its character, which includes both rolling hills and plenty of mature trees — something hard to find in many new subdivisions. “It’s also not uncommon for us to see deer, turkey, fox and other wild animals walking through our backyard at any given time,” Jennifer said. They love having the convenience a neighborhood provides, but love that their neighborhood also offers privacy. At night, the neighborhood makes the Chaneys feel as if they are miles and miles away from anything, yet I-840 is only four miles away; the nearest grocery store, just 15 minutes away. activities for us all to enjoy,” Jon said. “I have lived in large neighborhoods before with more than 600 homes and an active HOA, but nothing can rival the Fourth of July activities in our neighborhood. The Chaneys believe they’ve hit the jackpot in terms of having great neighbors. It’s not uncommon for their girls to be outside playing all day long, only to come in for meals. An old fashioned bell that hangs on the front porch serves as an audio reminder to them when it’s time to come home. “They hear that front porch bell ringing and they better come running,” laughed Jennifer. Having great neighbors who are there when you need them is one of the many benefits of living in Harvest Woods. Since their home on Beverly Randolph Drive is the third home in which the Chaneys have built, they have learned many lessons about the home building process over the years. “What I can say for certain is that not everyone should build a home,” Jon said. “For many people, buying an existing home and then customizing it for their needs or wants is probably their best bet.” The Chaneys say, in addition to having a great builder, there are a few other key characteristics in a person that will make or break the entire process. Building a home takes decisiveness, self-discipline and good communication skills. “There are so many decisions to be made that one must ultimately be able to make a decision and stick with it,” he said. Self-discipline is important as well, and perhaps the most difficult as lines often get blurred between wants and needs. The Chaneys spoke of how challenging it can be in the moment to want to say yes to an upgrade. Communication is also key to a good experience, and they feel blessed to have had a great one. “Tim would call us throughout the process without a specific agenda, just to check in and see how things were going,” Jennifer said. “If your builder is not doing that, then it is incumbent for you as the prospective homeowner to be proactive. There are many attributes of the Chaney home that make it special and unique. Both Jon and Jennifer agree they love the privacy their back porch provides, and also love being able to sit by the fire and watch college football outside on a cool fall evening. Another cool feature is that each of their children traced their hands and wrote Bible verses on the drywall in each of their rooms before they were painted. The hub of the Chaney home, like many, is indeed the kitchen. They have a small table and bench area that all five of them can huddle around and visit after the end of a day. What matters most in a home? To the Chaneys, the answer to that question is simple — the people in a home make it special. The Chaneys say they were just as happy living in their 1100 square foot home as they are this one. “Our faith, family and friends are what matter most in our home,” Jennifer said. Jon added, “As human beings we tend to place value on the things that we do and do not have, and we have to fight that inner voice that says, ‘If I only had this, then I would be happier.’ I suppose many people reading this article and looking at our home are making judgments about us, both positive and negative.